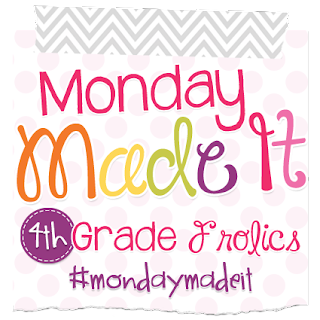 First Monday Made it of Summer 2015! - The Resourceful Room! 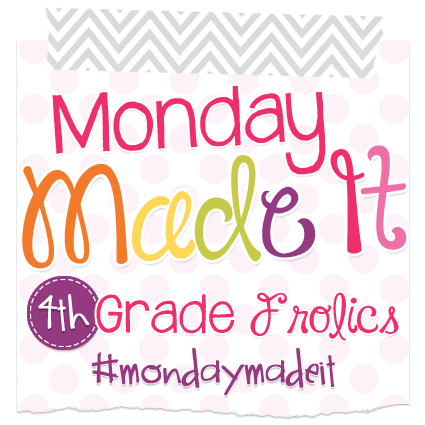 First Monday Made it of Summer 2015! I've already been on summer break for three weeks and I haven't even had a chance to link up with Monday Made it yet! I've gotten a lot done that I'm excited to share with you so here comes a picture overload! Up first is a desk redo that I am loving! I had this old desk/computer cart that I really wanted to use in my classroom but it was soooo ugly. I decided to give it a make over. See I told you UGLY! 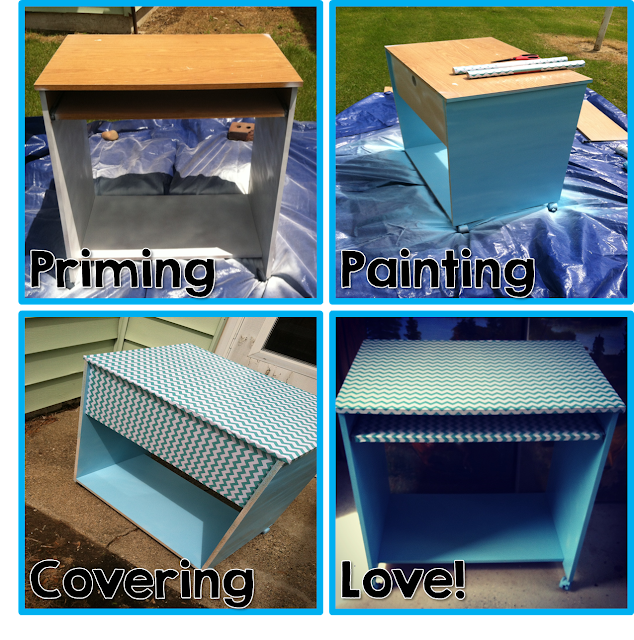 I primed it first since it's laminate, and then spray painted it with an aqua blue. I used this beautiful contact paper I picked up in the Target Dollar Spot to cover the top, and I love how it turned out! I am going to use this at the front of my classroom for my document camera and teachers guides. I really love it! Next I wanted new curtains. I searched and searched for something that would match and I just couldn't find anything I liked. So I decided to make some. 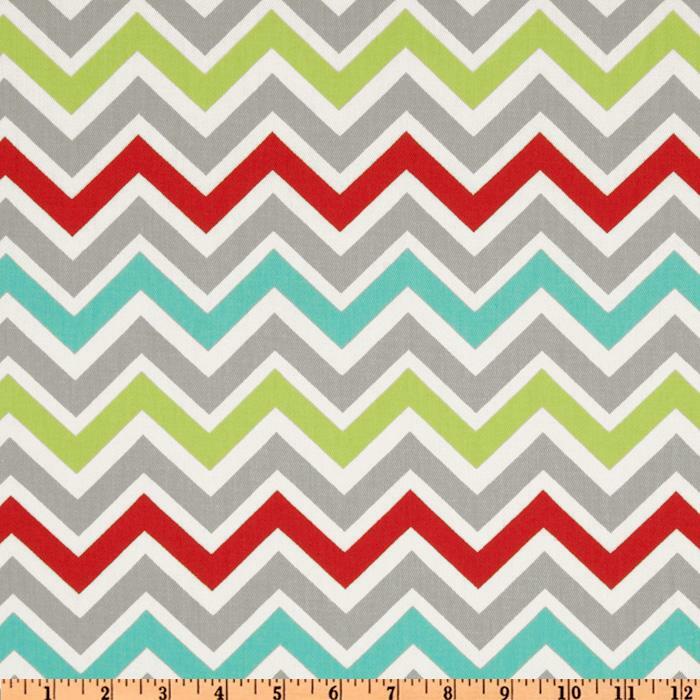 I ordered this fabric from Fabric.com. Which matches my room perfectly and sewed simple valances for my windows.I think they look much better than the old ones which didn't match my colors at all! 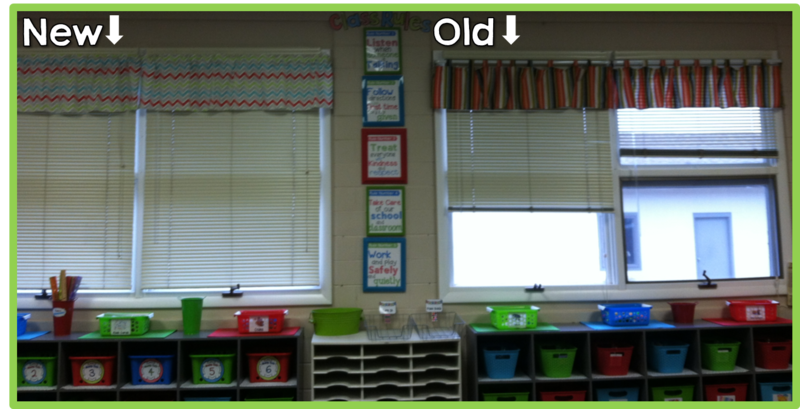 I had a large blank space in my classroom last year that I tried to hang things on but everything kept falling unless I used hot glue and after about November I just didn't have time to hunt down the ladder and use the glue gun to get things up there. So I decided to create some easy bulletin boards that I could pin stuff on. See that big blank space! I need to use that! 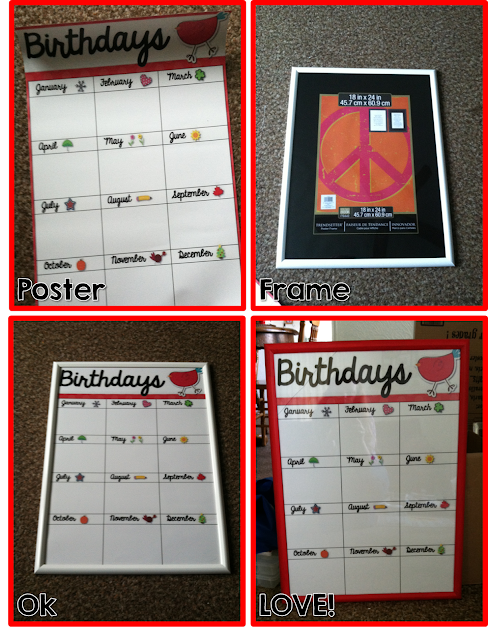 I got foam board from the Dollar Tree, I used spray adhesive to attach colorful paper and a boarder to each board. I LOVE this new Painted Palette Ombre border from Creative Teaching Press. I got the mounting tape from Menards. I used this last year for a hall display and it was great. It's removable but holds really well. 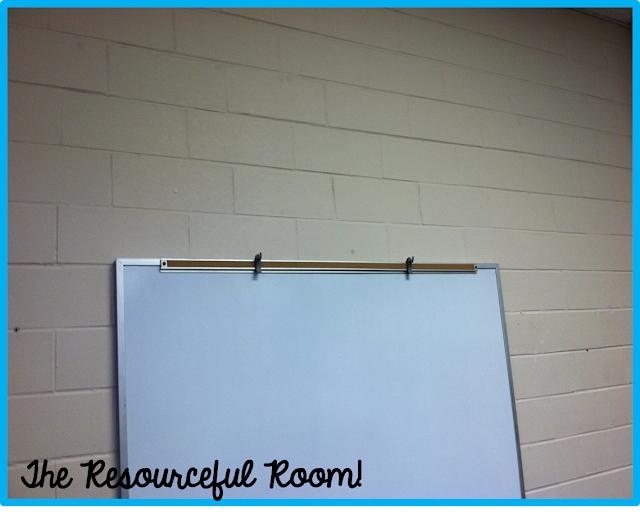 I taped the back of each board generously and then stuck them to the wall. Here's that space now! 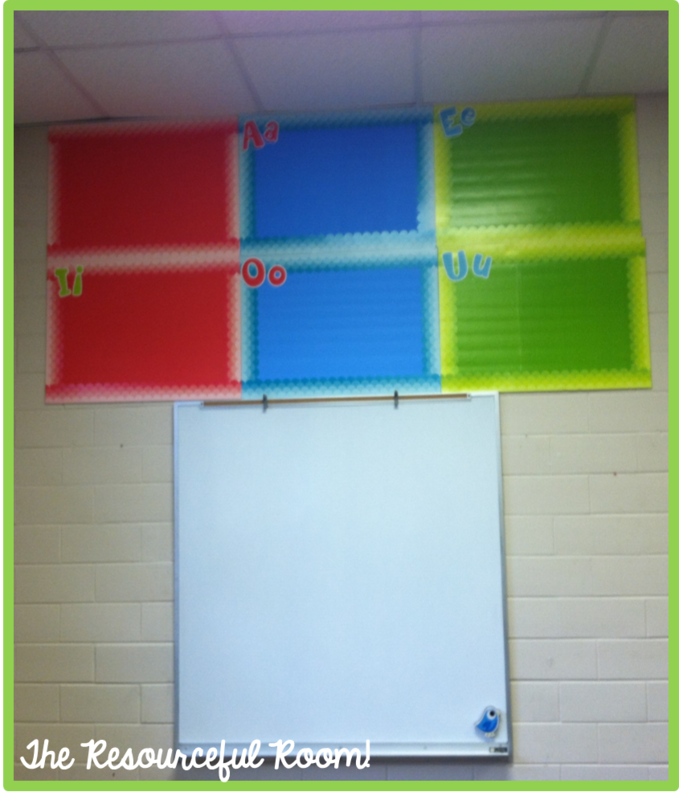 Can't wait to add our vowel team activities here this year! I added these above our writing center as well to display grammar and punctuation anchor charts! I saw this post by Melissa at Got To Teach and knew I wanted to make one! So I had the poster I made last year printed as 18x24 at Vista Print.. I got a poster frame at Michaels. It was white and I liked it but the poster blended in with it and I wanted it to pop, so I painted the frame red and I LOVE it! Can't wait to hang it in the classroom. I wanted name plates for my students desks that 1.) match the classroom, and 2.) have only the references that we really use all the time on them. So I made these. Again so very excited about these! They are exactly what I was looking for! Now head over to Tara's blog to see all the amazing teachers out there and what they are creating this summer! I love Monday Made it!! I used wrapping paper! It's cheap and you can get it in so many colors/prints at any local store. It was also the perfect width for the boards. It held up well on my bulletin boards last year so I'm using it again this year. You have been super busy! 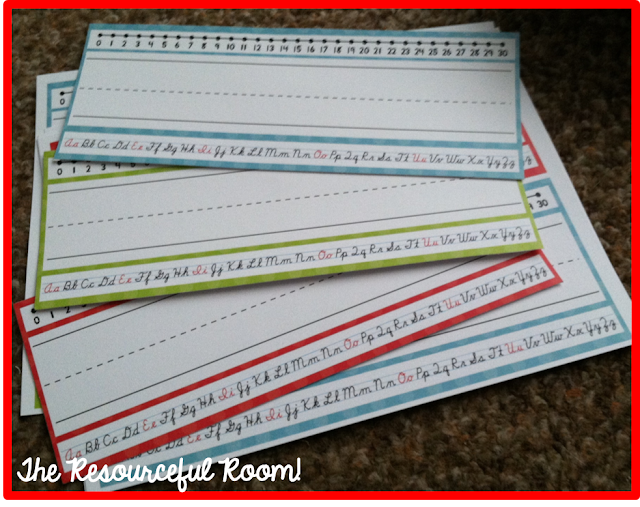 I love your new curtains and the desk tags....coordinating materials make me happy! :) Your idea for utilizing your white space is very clever and colorful. Last (but not least) is your birthday poster. The red frame really makes it pop! wow, you have been super busy! I love everything. I love how the simplest change can make something pop, that red frame is PERFECT! Thanks for so many ideas! I love all of your projects! 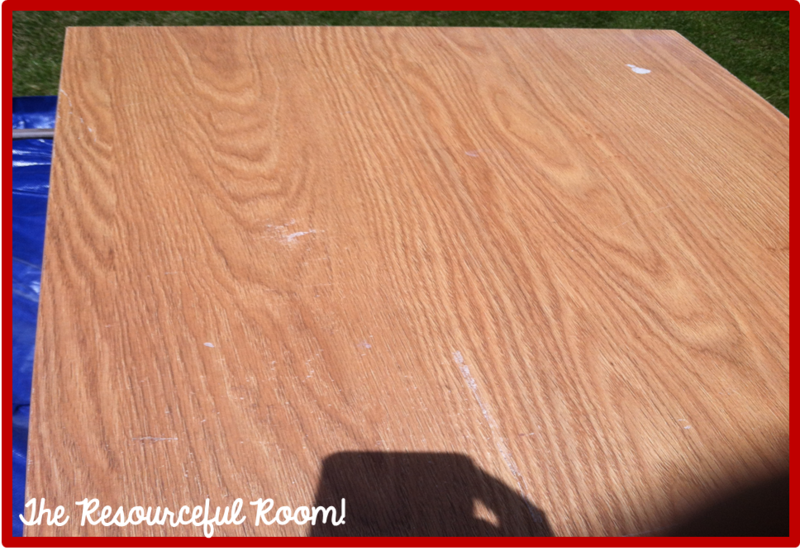 The desk turned out WONDERFUL! What a difference! Love all of the great things that you did! What a fun way to makeover your desk!! I LOVE how you were able to hang things on your walls too! What a great way to use that space!! 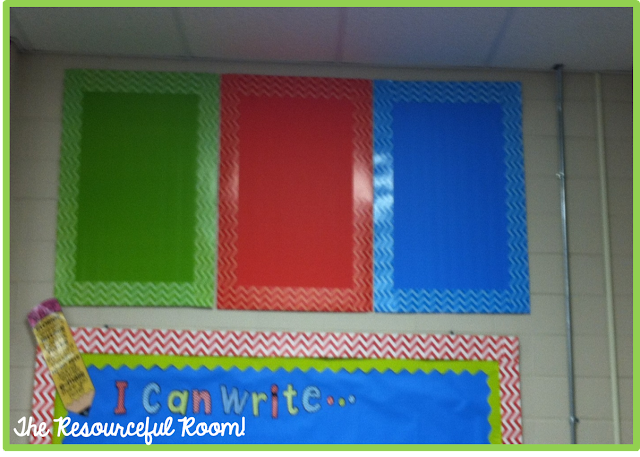 Love the poster board idea! I have a huge space just like yours that I should do this for. I hate cinderblock walls!!!! I love those nameplates, simple, yet colorful and stylish! I love your desk. I am wondering what primer and paint you used on it? 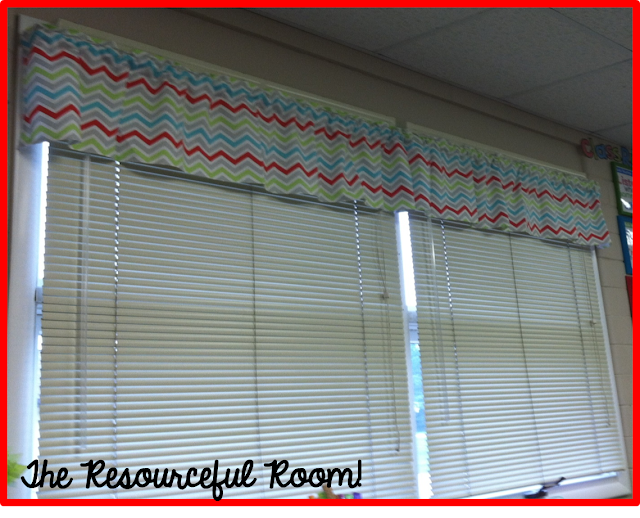 I love your new chevron curtains, so bright and fun. I'll have to remember that trick with the foam board, great idea. I'm your newest follower. I love your idea on the boards! I was wondering if you could give the name of the tape you used? I am moving to a "new" school with cinder block walls. I love your idea! Hi Stephanie, here's a link to the tape I used http://www.duckbrand.com/products/invisible-tapes/mounting-products/removeable-mounting-tape hope that helps!